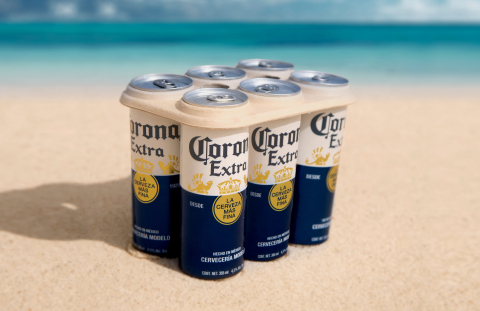 Corona becomes the first global beer brand to trial 100% plastic-free six pack rings. The new rings will be piloted in Mexico at the beginning of the year, with plans to test in the United Kingdom next year. Corona announced that it will pilot plastic-free six pack rings in select markets as part of the brand’s commitment with Parley for the Oceans to lead the industry with eco-friendly packaging. Both Corona and Parley have a shared mission to help protect the world’s oceans and beaches from marine plastic pollution. The partnership began with a commitment to protect 100 islands by 2020 and expands to include the pursuit of scalable innovation that can change the status quo. With roughly 8 MM metric tons of plastic entering the ocean each year1, there is a need to confront the issue on multiple fronts, which is why Corona has adopted Parley’s A.I.R. strategy to not only “avoid” and “intercept” plastic as much as possible, but also help “redesign” solutions that use the material. Although Corona is primarily packaged in glass and fiberboard, the brand sees an opportunity to help redesign a common source of plastic in the category: six pack rings. The plastic-free rings being tested are made from plant-based biodegradable fibers, with a mix of by-product waste and compostable materials. If left in the environment, they break down into organic material that is not harmful to wildlife, whereas the industry standard plastic six pack rings are made from a photodegradable form of polyethylene that results in increasingly smaller pieces of plastic if not recycled. Although most plastic rings are recyclable, the reality is that the majority of all plastic ever created hasn’t been recycled2, which is the motivation for brands like Corona to pursue solutions that avoid the material entirely. That journey starts in the brand’s homeland of Mexico, where the plastic-free rings will be piloted in Tulum at the beginning of the year. Since the partnership launched in 2017, Corona and Parley have conducted over three hundred clean-ups in over 15 countries, including the Maldives, Palau, Mexico, Dominican Republic, Chile, Indonesia, Italy, South Africa and Australia, with over seven thousand volunteers from more than two hundred locations participating in the project, totalling in more than three million pounds of plastic waste collected. Born in Mexico, Corona is the leading beer brand in the country, the most popular Mexican beer worldwide exported to more than 180 countries. Corona Extra was first brewed in 1925 at the Cervecería Modelo in Mexico City. Corona is a pioneer in the beer industry by being the first to use a transparent bottle showcasing its purity and high quality to the world. Each glass bottle is produced in a glass factory in Mexico owned by the brand. The artwork found on the bottle is painted, highlighting our commitment to quality in our packaging and our Mexican heritage. 3-я Международная выставка-ярмарка в области культуры прошла в Санье!